Imaginative instrumentation accompanying her unique finger-style guitar creates an evocative atmosphere for Parks to spin reflective tales and narratives in song, some drawn from her own family histories, set in the past and present South. 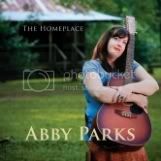 "The Homeplace," the second album by Abby Parks, is now available at CDbaby.com! The debut album by Abby Parks featuring romantic lyrics set against a rich tapestry of folk and classical fingerstyle guitar, as well as other instruments that the artist plays herself. Sometimes reminiscent of the folk music of the early seventies, and other times splashed with a sound all her own, Abby's album will leave you wanting more.